“Shakespeare.” By Matt Robinson. Perf. Bill Cosby, Phylicia Rashad, Malcolm-Jamal Warner, Roscoe Lee Brown, Christopher Plummer, and Carl Anthony Payne, II. Dir. Jay Sandrich. The Cosby Show. Season 4, episode 5. NBC. 22 October 1987. DVD. Urban Works, 2007. 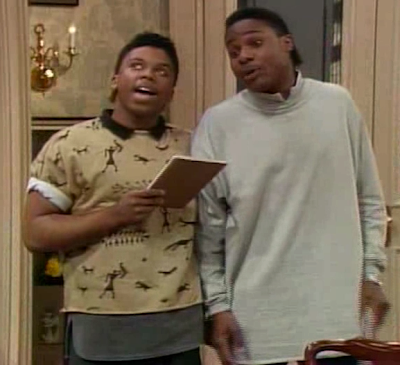 The Cosby Show moved from Macbeth in its second season to Julius Caesar in its fourth. After spending some time complaining about how boring Shakespeare is, the two young scholars (Theo and Cockroach) begin to realize that it makes sense after all. As a culmination of this epiphany, they perform a rap version of Mark Anthony's "Friends, Romans, Countrymen" speech. It's not difficult to find rap versions of Shakespeare plays—and not many of those rise to the top. This one seems fairly straightforward—pretty route—at first. But listen to the lyrics (and read them—they're printed below). There are some genuinely interesting and inventive devices here. For example, Anthony's "And Brutus is an honourable man" is transmuted into "Brutus is cool." In itself, that's nothing. But it's placed in a half line with no rhyming line to accompany it, and the effect is (as it is in Shakespeare) to call our attention to the line and to invite us to question its truthfulness. Additionaly, there's a majesty and magic in the rhythm, cadence, and alliteration of "Caesar was about to run Rome to ruin" and "Caesar said, 'No, baby,' and turned the crown down." Marvelous, that. Really. Uh, let me hold your ear. Uh, let me hold your ears. I didn’t come to bite, you see, I came to bark. As far as I’m concerned, it was cool with me. Caesar was about to run Rome to ruin. Caesar said . . .
. . . and turned the crown down. Which is how he justified the Ides of March deed. I say, Chill, homeboy, my heart’s with Dr. J. So let’s get busy ’til he comes this way. Doctor was taken to the bridge! And what I want to know . . .
Great Caesar’s ghost! Great Caesar’s ghost! He’s chilling most . . .
He’s chilling most from coast to coast! Links: The Show at IMDB. Brief Previous Post on the Subject. This gives me an idea for a whole new blog: Bardrap. The clip, following the Macbeth episode, is priceless. Thanks!